In an earlier post, I talked about the making of A’s tree, but since then so much more happened (including several large DIY projects). Since I used the tutorials of others, I think a link might be more appropriate (and time friendly) than recreating their wheels. My vision of the nursery was an airy space that played on the wildlife of our area, while still maintaining some feminine touches. As I noted before, we started with Benjamin Moore’s Riviera Azure 822, and the color is just lovely as the light changes. The next piece we added was the daVinci Emily crib from Overstock, which has been great so far, though the wood is a bit soft and may scratch easily. 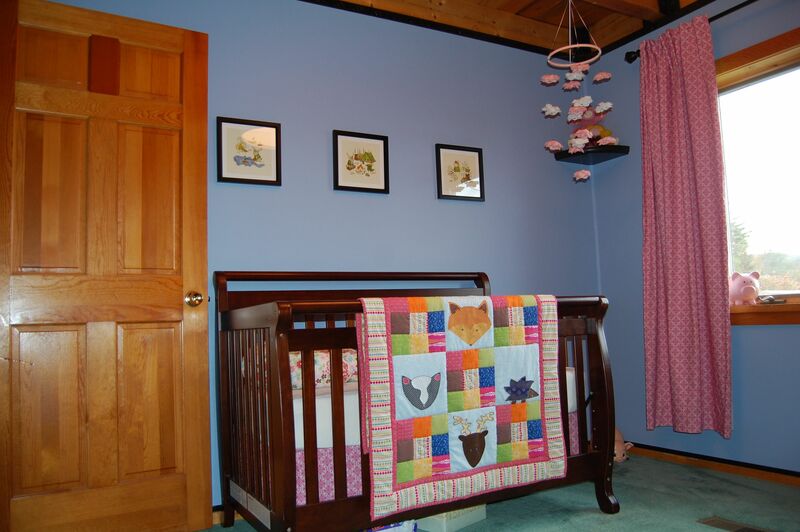 I made the quilt, designing the animals and color scheme myself, and the crib skirt via a tutorial from It’s Great to Be Home. The artwork is pre-framed Teagan White from Gallery Six 12×12; they are of excellent quality and gorgeous, gender neutral prints. We have Growing a Garden, Camping in the Woods, and Building Boats. The poster over our diaper changing table is also Teagan White’s Our House in the Woods (size large), which I framed myself. The curtains came from a great tutorial via View Along the Way. I was able to purchase all the materials for under $35 from our local Mardens (a salvage and resale store popular in Maine). We were lucky enough to receive the rocker from my mother as a baby shower gift and made the pouf from a downloadable PDF via Better Homes & Gardens online. 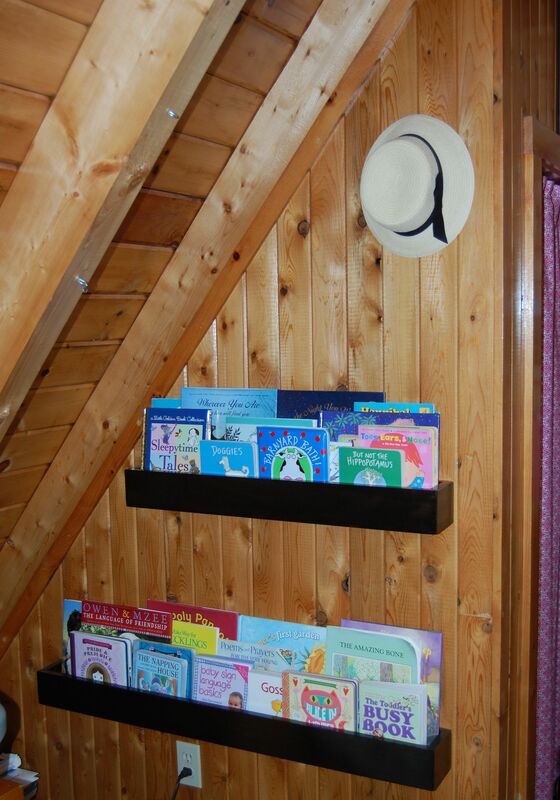 I had been looking forward to starting A’s library since before we even started trying to have a baby, but given the constraints of the room and the awkward A-frame ceiling, the only option seemed these great DIY shelves from Young House Love, which my father-in-law kindly made for us . They are stained the same shade as the Lowe’s molding he helped us install. We’ve since had to give over a shelf in our living room for more of A’s books, but what a delightful problem to have! I’m looking forward to the chance to explain our cloth diapering set up in a later post, but here’s a quick view of the dresser (yard sale steal) and closet (the curtain is made with the same tutorial as the window curtains, but without the blackout fabric lining). Jason added a second bar to the closet for a little more space, and I also re-purposed a sweater organizer for cloth flats that are too large or too small and other odds and ends. 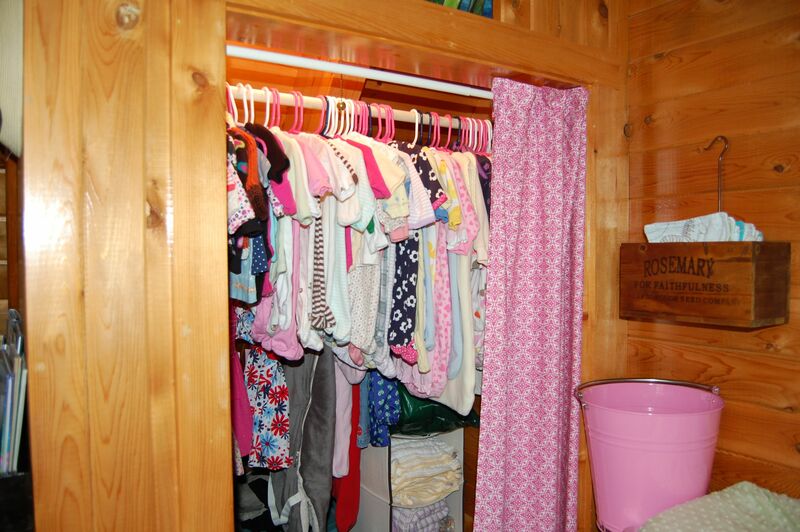 The pink bucket on the dresser (a shower gift) is great for holding cloth diaper covers. 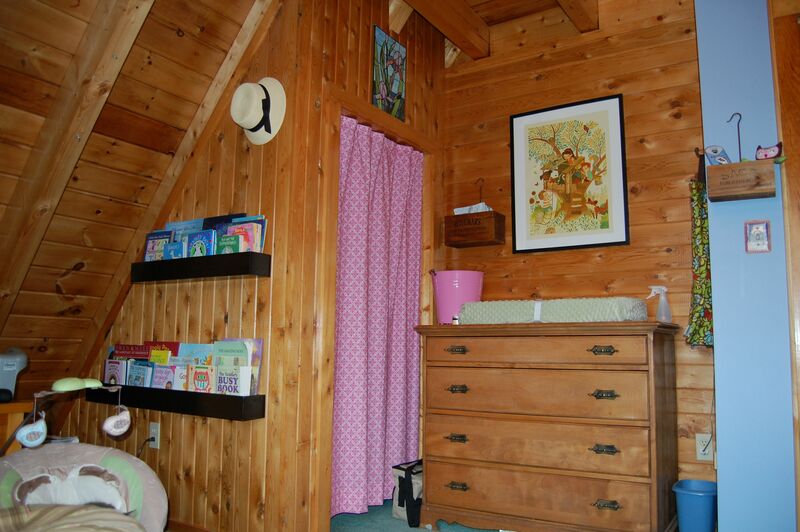 Eventually, I want to turn the very long open space at the back of the closet into a super-secret reading nook for A. 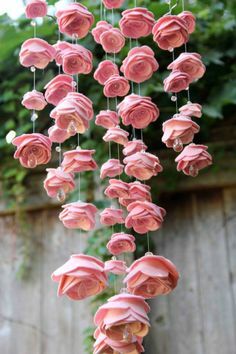 Finally, in the last two weeks before A arrived, I saw several gorgeous floral mobiles, but having already stretched my budget, I decided to make my own felt roses using a tutorial from How Joyful. 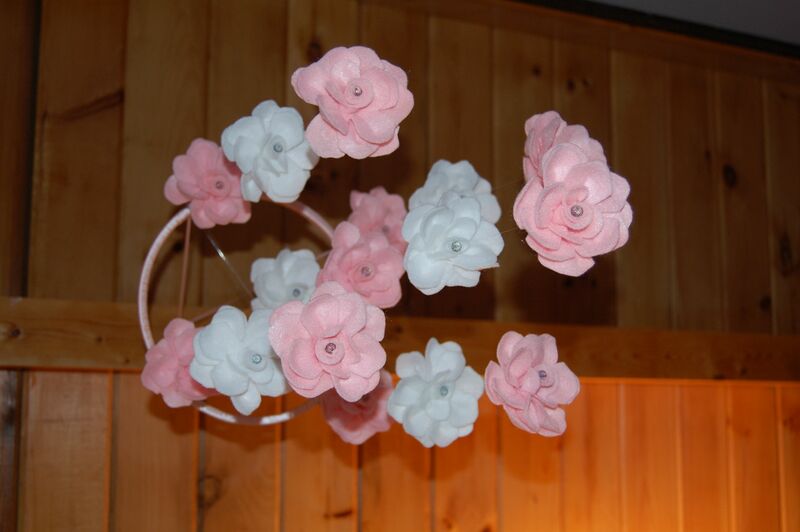 I then strung the flowers on fishing wire and hung them from a ribbon wrapped embroidery hoop. Total cost: under $10. Of all the items in the nursery, A is most intrigued by the mobile when the heat turns on and makes it sway above her crib. 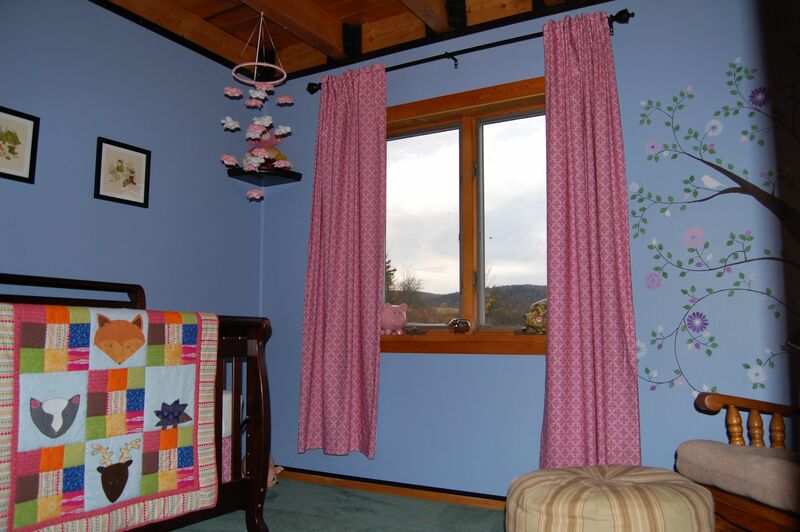 What are your child’s favorite parts of his or her room?